One of the last great source maps for the speculative cartography of the Pacific Northwest and Transmississippi. Carte du la Partie Septentrionale et Occidentale de l'Amerique d'apres les relations les plus recentes dresses en 1764 par Mr. ***. This is an extremely scarce, influential, and often misunderstood map of North America published in 1765 by Samuel Engel. This important map provides the source material for Dennis Diderot and Robert de Vaugondy's important speculative map of North America. 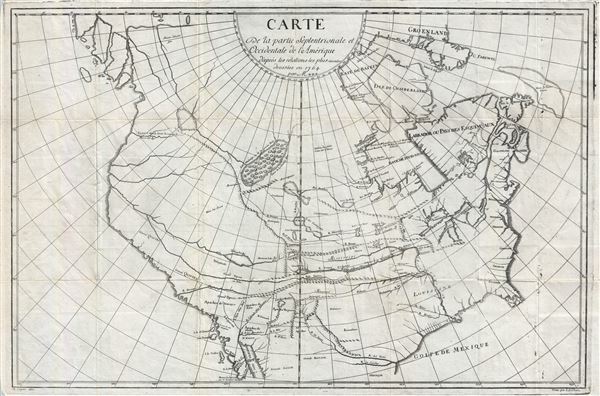 The Diderot/Vaugondy map was published as part of a 10 map supplement to Diderot's popular Encyclopedie intended to explore positivist speculation on the still unknown cartography of western North America. While the latter Diderot/Vaugondy map is reasonably common, this, its source map, is far more significant and rarely appears on the market. The scarcity of this map can be illustrated most plainly by the fact that, despite its importance, this map is not identified in Wheat's Transmississippi West (the derivative 1771 Vaugondy/Diderot Map is included). Engel's map covers all of North America from the Gulf of Mexico to the Arctic Circle and from the Grand Banks to what appears to be a proto-Alaskan archipelago. It is presented on an unusual equidistant cylindrical projection, possibly on the c. 1745 Cassini-Soldner model. Engel's map consolidates numerous cartographic theories, reports from voyages both dubious and factual, and established conventions from earlier maps, into a sophisticated and fascinating examination of the general layout and waterways of North America Â– especially in the west. Engel is cautious not to specifically show a Northwest Passage while at the same time leaving open the possibility that such a passage may indeed exist. Rivers and lakes extending from the eastern part of the continent almost, but never quite, meet their western counterparts. Six largely mythical river systems extend inland from the unlabeled Pacific. Several meet with enormous and interesting apocryphal lakes, including Lac Michinipi, Lac Tahuglauks, and an unlabeled lake that Vaugondy, in his derivative map, associates with the mythical Lake Conibas. Through error or luck, it is interesting to observe not only where Engel went wrong, but also where he got things right. The southernmost of the several great western lakes identified here is Lake Tahuglauks, situated essentially where Great Salt Lake actually exists. The cartographer here is references the dubious explorations of the Baron Louis Armand de Lahonton (1666-1715). Lahonton was a French military officer commanding the fort of St. Joseph, near modern day Port Huron, Michigan. Abandoning his post to live and travel with local Chippewa tribes, Lahonton claims to have explored much of the Upper Mississippi Valley and even discovered a heretofore unknown river, which he dubbed the Longue River. We can see this river extending westward from the Mississippi near the Falls of St. Antoine (St. Anthony Falls, modern day Minneapolis Minnesota). This river he claims to have followed a good distance from its convergence with the Mississippi. Beyond the point where he himself traveled, Lahonton wrote of further lands along the river described by his guides. These include a great saline lake or sea at the base of a mountain range. This range, he reported, could be easily crossed, from which further rivers would lead to the mysterious lands of the Mozeemleck, and presumably the Pacific. By incorporating Lahonton's mountains, Engel effectively puts in place the Rocky Mountains. Various scholars both dismissed as fancy and defended as speculation LahontonÂ's work. Could Lahonton have been describing indigenous reports of the Great Salt Lake? What river was he on? Perhaps we will never know. What we do know is that on his return to Europe, Lahonton published his travels in an enormously popular book. LahontonÂ's book inspired many important cartographers of his day, Engel, Moll, De LÂ'Isle, Popple, Sanson, and Chatelain to name just a few, to include on their maps both the Longue River and the saline sea beyond. The concept of an inland river passage to the Pacific fired the imagination of the French and English, who were aggressively searching for just such a route. Unlike the Spanish, with easy access to the Pacific through the narrow isthmus of Mexico and the Port of Acapulco, the French and English had no easy route by which to offer their furs and other commodities to the affluent markets of Asia. A passage such as Lahonton suggested was just what was needed and wishful thinking more than any factual exploration fuelled the inclusion of LahontonÂ's speculations on so many maps. Another indigenous legend that appears prominently in Engel's map is his incorporation of the voyages of the Yazoo explorer Moncacht-Ape. Moncacht-Ape may have accomplished the first recorded roundtrip transcontinental journey and provided Europeans with the first first-hand report of the Columbia River (noted here as 'Icy paroit etres le terme du voyage de Moncacht Ape'). This epic journey most likely took place in the late 17th century. The tale was later passed on to Antoine-Simon Le Page du Pratz, a French explorer and ethnographer in Louisiana. Page met Moncacht-Ape near Natchez sometime before 1729 and recorded his fantastic tale, which he later published in 1753. Unlike the voyages Lahonton, most scholars consider the Moncacht-Ape exploration to be factual, though possibly embellished by La Page. Two factors contribute to this. First, the Moncacht-Ape tale includes none of the speculative geography common to European mapping of the American west. Second, Page's account, while the largest and most thorough, is not the only account of Moncacht-Ape. Other known persons of the period, most notably the French officer Jean-Francois-Benjamin Dumont de Montigny, also made reference to this voyage and claim to have met Moncacht-Ape. Other western lakes are more mysterious. These include the large and striking island filled Lac Michinipi, and a smaller unnamed connected lake to the west. Engel's source material for both of these is unclear. Michinipi may have some relation to the c. 1730 explorations of the French fur trappers La Verendrye and Nicolas Jeremie. Some suggest this may have been an early account of Reindeer Lake. Later cartographers associate Michinipi with Lake Assiniboine, though here Engel makes them two separate lakes. Both explorers traveled the rivers and lakes between Lake Winnipeg and the Hudson Bay, as well as the connections to other lakes further north. The larger lake further to the west is something of a mystery, as are its connections to several large arctic river systems. Vaugondy, in his map issued five years later, associates this with the mysterious and speculative 16th century Lake Conibas. Engel makes only a few notes regarding the indigenous peoples of the region. All those west of the proto-Rocky Mountains, he identifies as 'Allies of the Souix,' an assumption no doubt drawn from Jesuit journals. He identifies three mythical kingdoms of the west, Gran Teguaio (Teguayo, also Tolm), Grand Quivara, and Anian. Quivara was initially a civilization sought out by the conquistador Coronado in the Great Plains near the Mississippi. Cartographers steadily moved Quivara further and further west until, as here, it appears in California. Teguayo was believed to be one of the seven Kingdoms of Gold presumably to be discovered in the unexplored American west. The name Teguayo first appears in the Benevides Memorial, where it is described as a kingdom of great wealth to rival Quivara. The idea was later popularized in Europe by the nefarious Spanish conman and deposed governor of New Mexico, the supposed Count of Penalosa, who imagining himself a later day Pizzaro, promoted the Teguayo legend to the royalty of Europe. Originally Teguayo was said to lie west of the Mississippi and north of the Gulf of Mexico, but for some reason, Engel situates it far to the west. Far to the north on the Arctic coast, north of proto-Alaska,Engel identifies the Land of Anian. The first mention of Anian appears in Marco Polo's narratives, which describe it as 'a place to the east of India.' This India is not modern India, but rather a term that refers to farthest Asia. Since the time of Mercator this term was associated with the extreme northwest of America and a possible straight or even land connection with Asia. Our last item of note will be Engel's curious treatment of the lands to the west of Anian that we have earlier described as a 'Proto-Alaska.' Kershaw considers Engel's cartography here derivative of Muller's map of 1754. Muller, a historian and cartographer employed by the Russian Academy of Sciences, published a map based on actual Russian discoveries in refutation of the more popular speculative Delisle / Buache maps of the same region. Muller identifies several of Vitus Bering's documented sightings of land either on the Alaskan peninsula itself or the Aleutian Islands. These he connected to form a speculative peninsula. Engel here takes the idea a step further by turning each sighting of land into an independent island with navigable watercourses in-between. The reasoning behind this choice is unclear, but it may have to do with wishful thinking that his Lake Michinipi, which he connects to Anian via riverways, may in fact be a route west via the Lake Winnepeg network. This first edition first state map was drawn in 1664 for Engel by M. Jaquier and engraved by I. A. Chovin in Paris for publication in his 1765 Memoires et Observations Geographiques et Critiques. Samuel Engel (1702-1784) was a Swiss geographer, agronomist, and mathematician active in the middle part of the 17th century. His main work, Memoires and Observations was published in 1765 and while somewhat obscure today was highly influential in the 1700s. Engel argued that ice only formed in fresh water and that, such being the case, the Arctic Ocean would be ice-free and navigable closer to the poles. Engel's theories influenced exploration in search of the Northwest Passage, specifically, the launching of the disastrous 1773 Phipps expedition to the North Pole. He also wrote several articles for Diderot's Encyclopedie, including a description of a pre-Columbian Chinese colony in North America - Fusang. Engle also argued that Baron Lahonton, an enigmatic explorer of America's inland waterways, was in fact fictitious - though he nonetheless incorporated Lahonton's geography in his own maps. Engel, S., Memoires et Observations Geographiques et Critiques sur la situation des Pays Septentrionaux de l'Asie et de l'Amerique, d'apres les Relations les Plus Recentes, (Lausanne) 1765. Very good. Right half of map is slightly out of register, giving the smaller place names a double-struck appearance. Printed on heavy weight paper, contemporary folds with no corner cracks, very good condition. Kershaw, K., Early Printed Maps of Canada, vol IV, no. 1122.